Are you looking for new marketing campaign concepts? Are you looking for new ways to target select fan bases? Hunky Dorys recently launched a new Irish Rugby messaging campaign that has attracted worldwide attention. How did they do it? 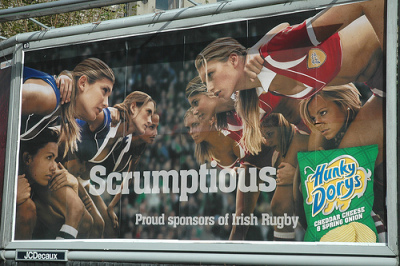 The chip brand opted to launch a controversial outdoor messaging campaign that features attractive female rugby players in revealing poses. The campaign, featured in bus shelters and on billboards across Northern Ireland, is drawing a mix of rave reviews and criticisms from parties across the globe. Either way, the campaign has worked - it has driven a significant amount of buzz and attention to the brand. The only problem? As an Irish Rugby Football Union spokesman recently said, Hunky Dory has no direct affiliation with the Irish Rugby Football Union and Irish Rugby - they are just simply sponsors of the Navan Rugby team.